With the decorations up and the carols a-blaring, Tredegar House opened its doors last night for the first time this festive season: the butler was prompt in answering the front door; Lord Tredegar welcomed guests in the Dining Room with his usual matchless grace; there was singing and dancing aplenty in the New Hall and Gilt Room; a storyteller weaved tales in the Best Chamber; a feather boa draped Olga, Lady Tredegar chatted with visitors in the King's Room; Tiny Tim limped about looking for sympathy; Mr Bumble was on the hunt for orphans for the workhouse; the cook seemed suspiciously jolly in the Kitchen; Father Christmas worked very hard in the grotto, and Scrooge showing no sign of getting into the spirit of things, attempted to sleep through it all in his bed chamber. And that was just the first evening. This year I am playing the part of Scrooge. It is quite refreshing to be the one person in the House who is not jolly; even Mr Bumble obviously enjoys his work. And a miserable devil you were too! You told me I could boil in my own pudding just because I wished you Merry Xmas! We (family of four) went last night and had great fun. 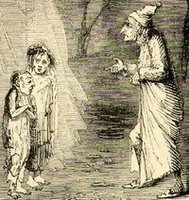 Mr Bumble tried to send my daughter to the workhouse (we encouraged that idea), the grotto was wonderful as always and we enjoyed the music in the Hall.